Haylie Pomroy has helped countless clients lose up to 20 pounds in just 4 weeks –all through the fat-burning power of food. Hailed as the metabolism whisperer, Haylie reminds us that food is not the enemy, its the rehab needed to rev-up your sluggish, broken-down metabolism and turn your body into a fat-burning furnace. On this plan you're going to eat a lot. You’re going to eat three full meals and at least two snacks a day – and you're still going to lose weight. What you're not going to do is count a single calorie or fat gram. You're going not to ban entire food groups. You're not going to go carb-free or vegan or go cold turkey on the foods you love. Instead, you’re going to rotate what you’re eating throughout each week according to a simple and proven plan carefully designed to induce precise physiological changes that will set your metabolism on fire. By keeping your metabolism guessing in this specific and deliberate way, you'll get it working faster. This isn't just a theory, it's the results-based product of Haylie Pomroy's successful programs. It’s worked for celebrities, for athletes, and for people with chronic illnesses who need to lose weight, doctor’s orders. Now it's going to work for you. Plus, by switching up what you’re eating every few days, you'll get to enjoy a greater variety of foods, so your palate will never feel bored or deprived. 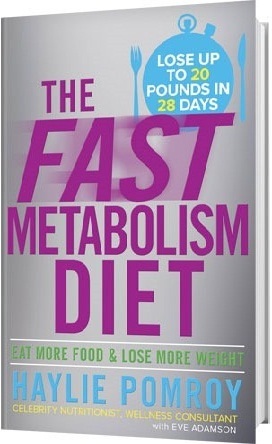 Complete with 4 weeks of meal plans and over 50 recipes – including vegetarian, organic, and gluten-free options – this is the silver bullet for the chronic dieter who has tried every fad diet and failed, the first time dieter attempting to kick her metabolism into gear, and anyone who wants to naturally and safely eat her way to a skinner, healthier self.